Tuesday night Hillary and I had coffee for dinner. I know she wrote earlier to check out my post and now that I’ve just told you we had coffee for dinner you’re disappointed. Alright, alright, we didn’t simply have it straight from the brew pot but it was there. In the lamb ragu and the vinaigrette on our salad. A short bike ride to Crop to Cup‘s coffee bar earlier that day gave me the inspiration to try coffee in these not so conventional ways. I already knew that meaty flavors paired well with coffee (think coffee spice rubs, coffee in bbq sauces) and seeing that the weather had turned a bit more fall-like I thought it was high time for a hearty stew. 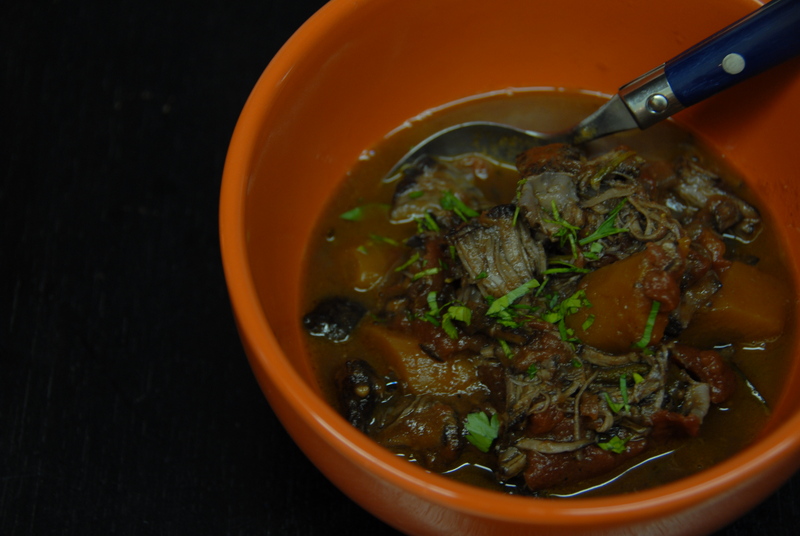 I thought a little touch of coffee could only help build the beautiful earthy flavors of a lamb ragu…and as it turns out, I was right! Ah hah! Love it when that happens. You’ll want to cook this low and slow so start by preheating the oven to 275 degrees. 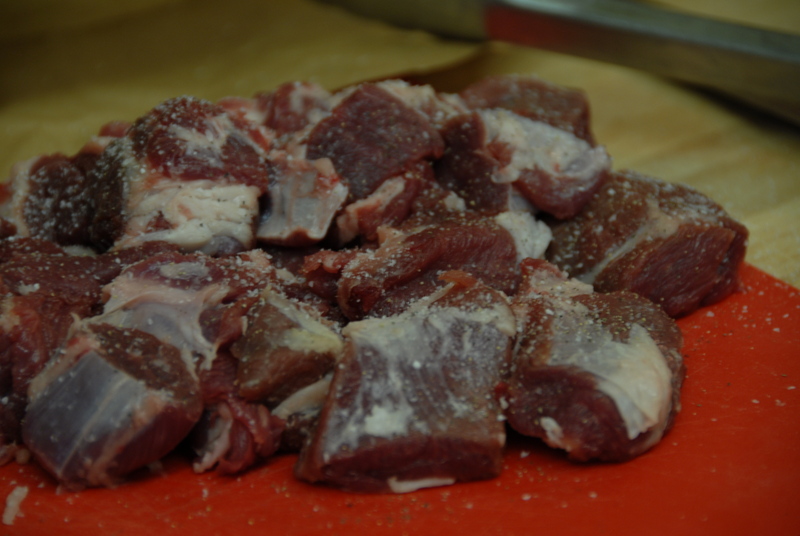 Trim and cut the lamb in small like-sized pieces. Heat a heavy pot over high heat and season the meat well. In a tablespoon of vegetable oil (and some reserved bacon fat if you so desire…hold the judgement please) brown the lamb pieces. 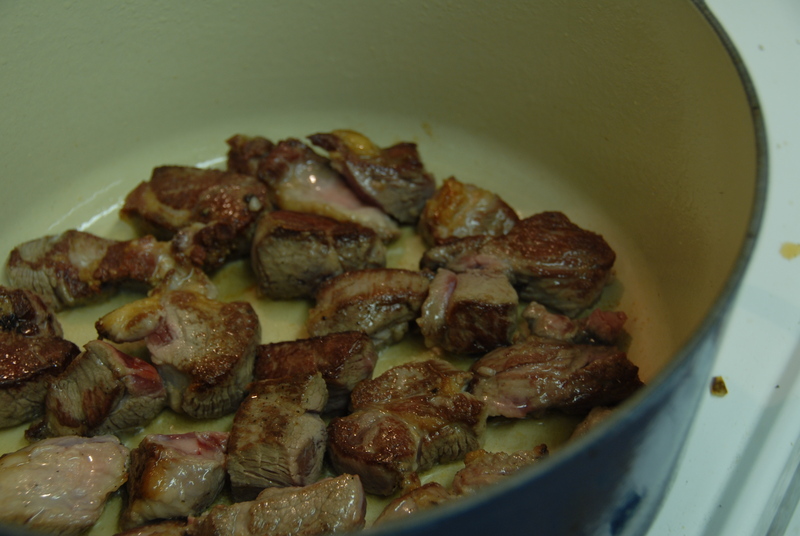 You want to achieve good brown color on the meat before stewing it so make sure that pot is really hot! Next add the onion and carrot. Turn down the heat a bit and cook until the onions begin to brown. Add the sage, rosemary and garlic. (*Note: I wish I had wrapped these in cheesecloth for easy removal at the end.) Stir and cook a few minutes longer. Start adding the wine. After the first addition scrape up the brown bits on the bottom of the pot – that’s flavor stuck on there! Add the coffee and tomatoes, stir to incorporate. Bring to a simmer on the stove top and then cover and place in the oven. I checked on the stew after about an hour and a half, you’ll want to make sure the liquid doesn’t boil. In total it cooked for almost 3 hours. You want the meat to be easily shreddable. 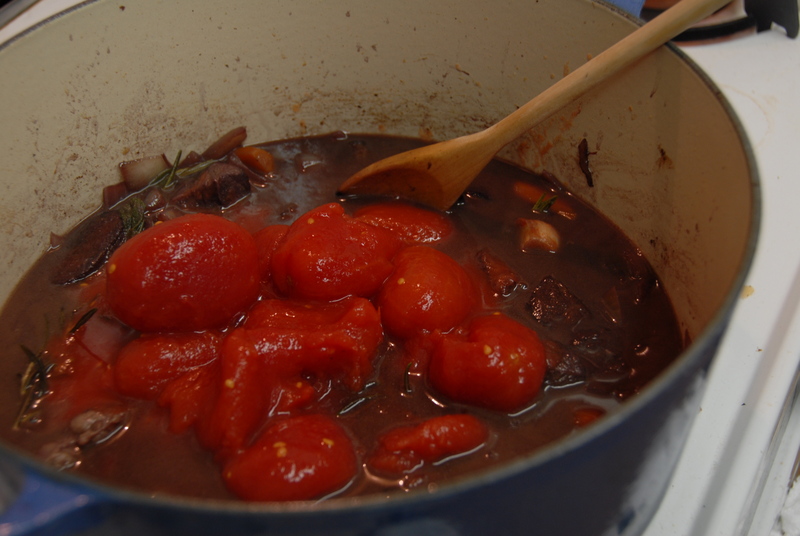 To finish the ragu – strain the sauce, set the meat and vegetables aside and place the liquid back in the pot – bring to a simmer and reduce. Taste and season with S&P. (and a touch of butter never hurt anything…) Place the shredded lamb and vegetables back in the sauce and enjoy. Hillary and I enjoyed this atop buttery linguine noodles but I also had it for lunch straight up. It just gets better as the days go by… mmm… In the Barista article there was a coffee vinaigrette that had caught my eye. The chef infused sherry vinegar with coffee grounds…sounded intriguing, and quite possibly delicious. 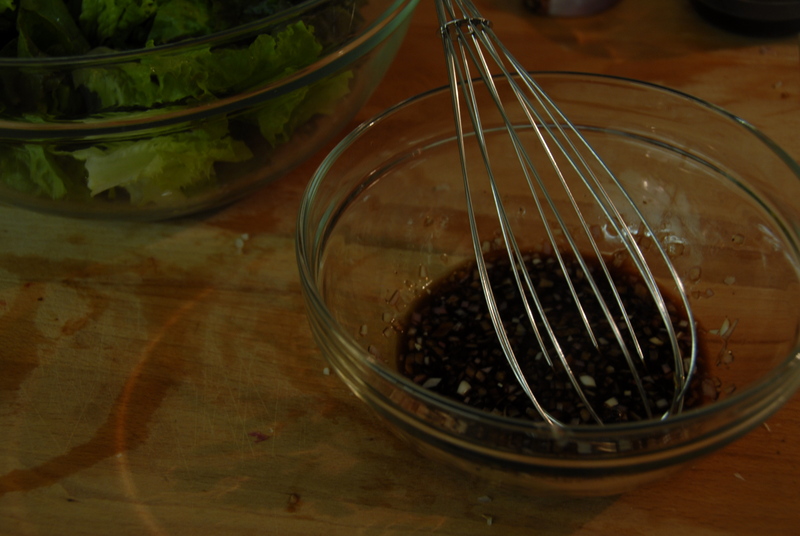 I used aged balsamic and red wine vinegar instead of sherry. The result: a deep, complex vinaigrette that was a great alternative to a classic. 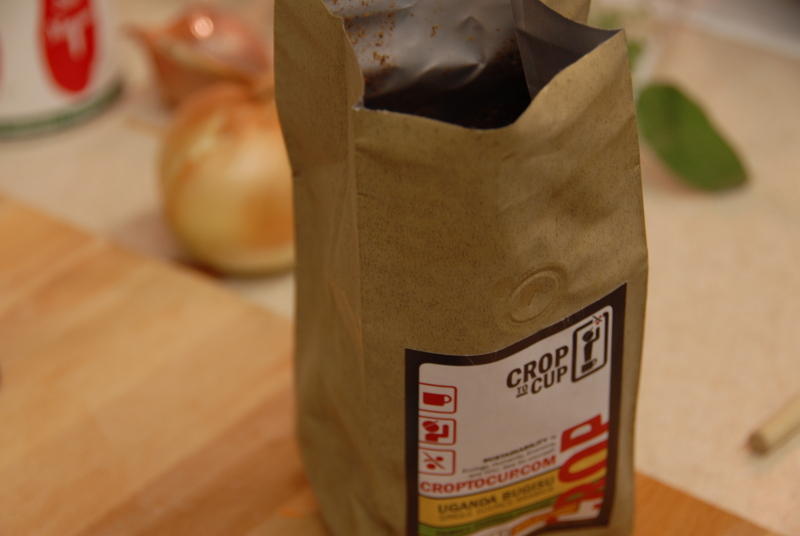 This entry was posted in Coffee, Uncategorized and tagged coffee, Crop 2 Cup, cup a joe, dinner, lamb, ragu, vinaigrette. Bookmark the permalink.